Starbucks Frappuccino Happy Hour starts tomorrow for Starbucks Rewards Members! Get a heads start on this promotion if you are a Starbucks Rewards member! 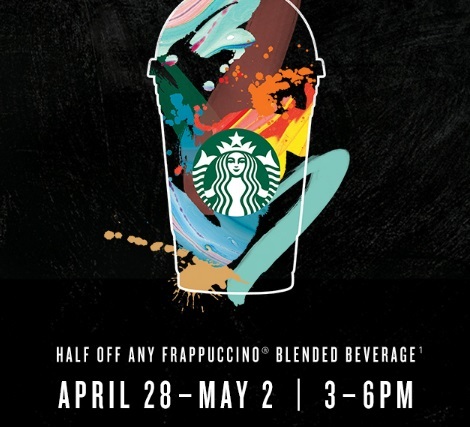 Get half off frappuccino blended beverages from April 28-May 2 between 3-6pm. Please note you must pay with your registered Starbucks Card or App to get this offer! Also remember you can automatically get Starbucks Gold Status (or a one-year extension if you are already Gold) by making one purchase by May 2, more info here.